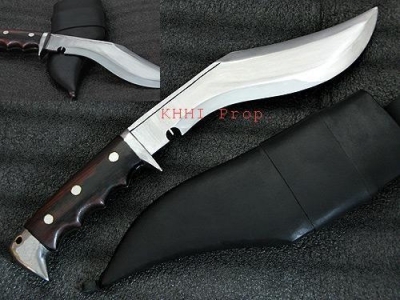 A well versed mini sized full flat tang kukri that is beautifully designed, glossy and attractive but at the same time designed to deliver the act with full strength. The blade is made semi polished for silky look and has extended bevel to strengthen the ability to cut deep and precise, it is bigger and boarder hence the name Pattiwal. The notch of this kukri is modernized and made different than the original notch. A modern look with much durability hence the favorite among hunters, trekkers or simply kukri lovers for its look. Since the look of this Pattiwal kukri is made modern, the handle is also made modern to complement each other. The handle is made out of horn however if horn is not available black wood is used. The horn or the black wood remains unpolished for better grip, the shape and silhouettes is designed for superior handling of the kukri while in action but also to give a modern look and better finishing. It has a full FLAT tang handle riveted with 3 solid brass rivets for durability. For easier carriage, the lanyard hole is added at the end of the handle to inset the thong as wrist belt. Sheath is made simple with normal buffalo hide, single loop leather frog is an added value. 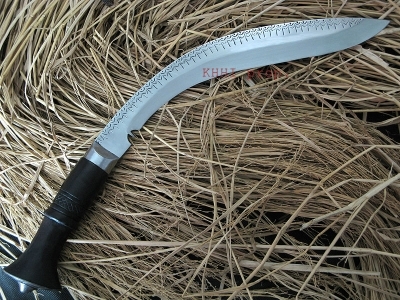 A Lanyard hole is made at the tip of scabbard so that the string can be tied to the thigh to prevent wobbling of Khukuri while walking or working. 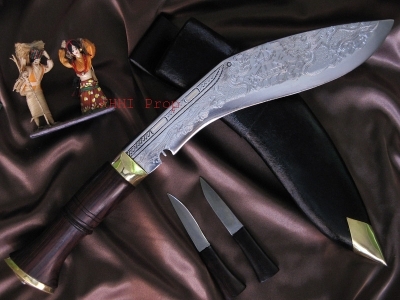 PATTI in a kami term means bevel , hence the name Pattiwal, as the name denotes the khukuri has a large bevel and is a Full-tang Kukri. 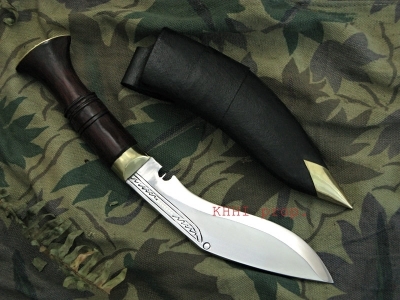 This kukri is Mini; compact and cute. 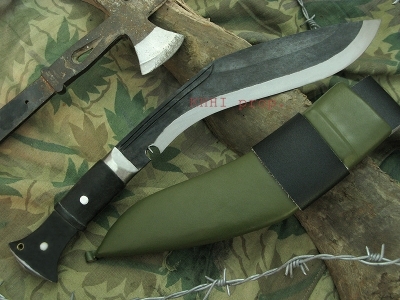 It is a well composed, reliable kukri produced with all the important and necessary features. 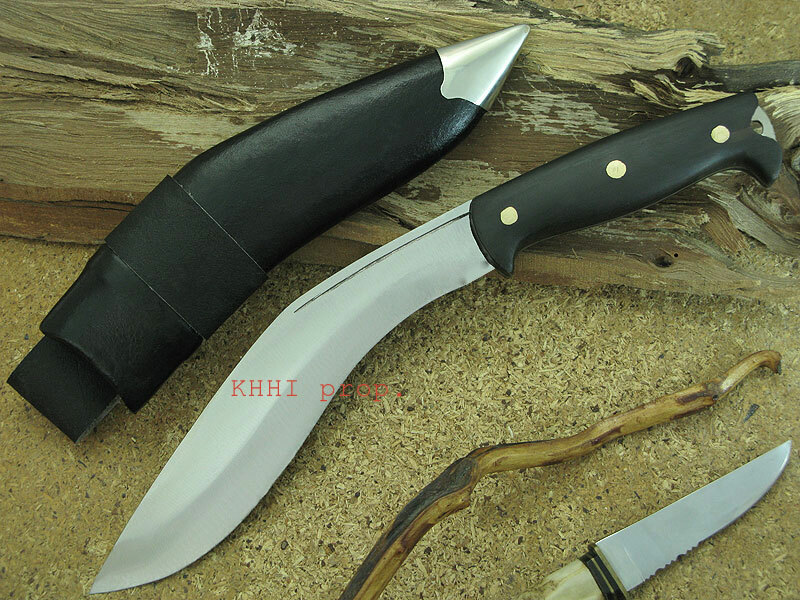 Perfect handy sized blade with large elongated effective bevel backed up by a full-flat tang compact-comfort handle distinguish this kukri from the rest and is the favorite of trekkers, hunters, gift-givers, collectors, naturalists and many more. Blade: The blade is Semi-polished to give a smooth and silky texture with a strong panel. The bevel is large and wide, broader and elongated to enhance the cutting ability for better impact (deeper cut). It has a unique notch to give a completely modern look. Scabbard: The scabbard is made simple with a single loop. A lanyard hole is fitted at the tip of the sheath for a string or cord to go through to tie around thigh so wobbling can be minimized when moving around.